The great American philosopher Eric Hoffer once wrote, “Mass movements can rise and spread without belief in a God, but never without belief in a devil. 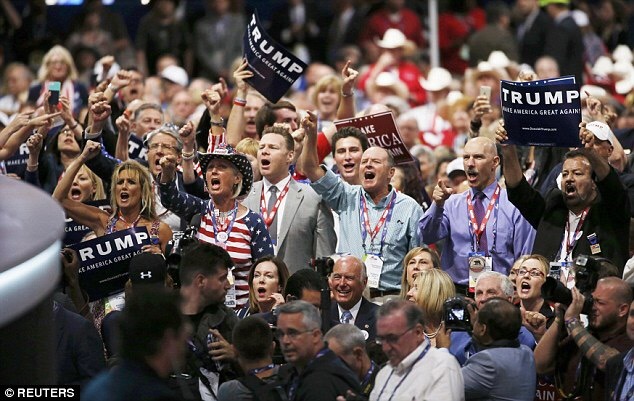 Usually the strength of a mass movement is proportionate to the vividness and tangibility of its devil.” Last night the Republican convention managed to sink deeper into the realm of collective madness than any American political party ever has. The fact that many in the media are treating this a politics as usual miss the all too important insight that these are the exact phrases used by Nazi to demonize their opponents as they marched toward power, which they then later put into action once power was gained. Those who believed that the Nazi’s words were hyperbole found out too late that they actually meant them. The troubling thing as that of vein before he won the nomination Trump has endorsed physical violence against opponents and even promised to pay the legal fees of supporters who assault opponents, tried to shut down judges, and banned reporters who criticize him from his campaign events. The fact that he is doing this should send shivers into anyone concerned with civil liberties, and not just liberals. Already the Republicans who have voiced opposition to Trump are being run out of the party and demonized as traitors. Once ensconced in power Trump will use his executive powers in ways never imagined by the Founders. He has no respect for the separation of powers and will ignore the Constitution, Congress, and the Courts anytime that he desires, and sadly, if he has a Republican majority in Congress, he will get all that desires. Like the Nazi dominated Reichstag, Congress will become nothing more than a rubber stamp for Trump’s edicts. Those conservatives who thought they would be able to restrain Trump will, like the German conservatives of the 1930s will be disappointed. Those who don’t support him will be purged. But then hatred is all the GOP has left to offer. As a former lifelong Republican the spectacle is profoundly disturbing.